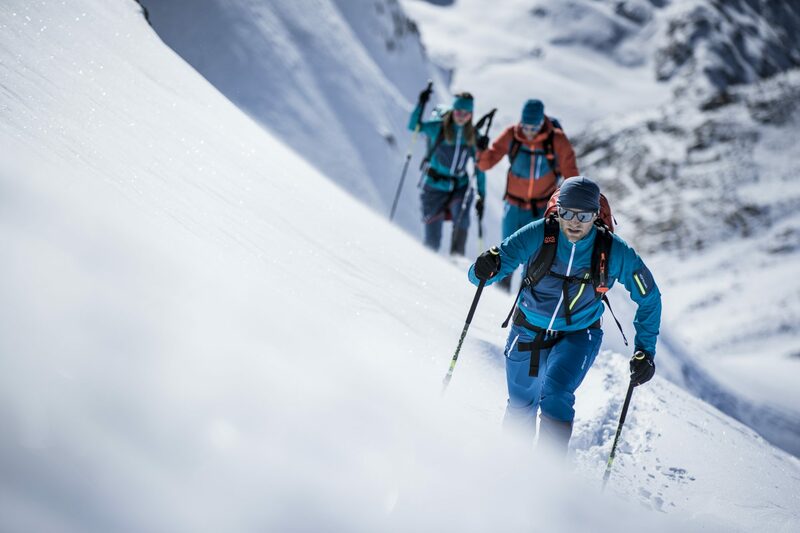 Off-piste skiing and touring can be surprisingly safe (about the same risk as driving a car for one hour) if we regularly apply the risk reduction measures we learn in avalanche training. If we do not apply these measures however, it can be surprisingly dangerous according to renowned avalanche expert, Bruce Tremper. At Henry’s Avalanche Talk (HAT), more and more, we emphasise that learning and knowing is only half the battle. The applying of our knowledge and experience is what really counts. It’s not just research that shows this, as my story here describes. Over the years I’ve noticed that most people, most of the time, do not apply basic risk reduction methods when they go off-piste even though they are aware that the consequences can be very high…like death. This means that most of us are being more dangerous than we would normally be comfortable with. I’ve observed this over three decades of delivering avalanche awareness talks and courses throughout Europe. 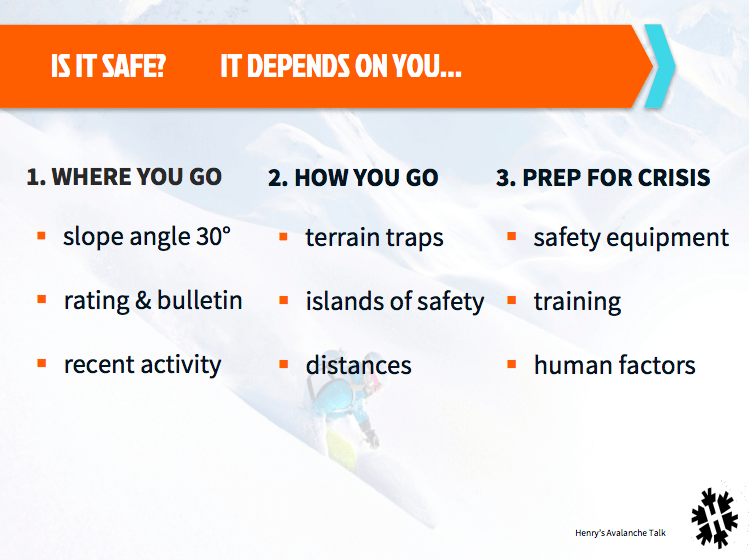 My conclusion: even if we think we know all about the danger and how to manage the risk off-piste, we probably don’t. Why wouldn’t we apply simple risk reduction measures in high consequence risk contexts like that of off-piste skiing in the Alps? ​Because nothing happens most of the time when we don’t apply them. 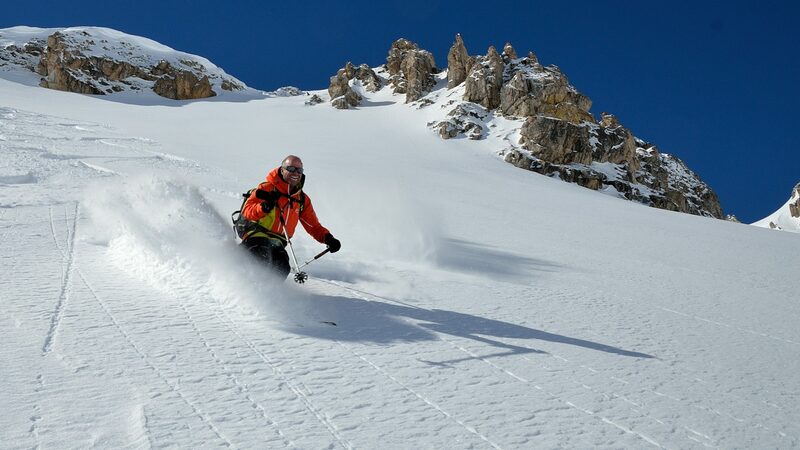 Observation and research show that even if we ski on hundreds, even thousands, of steep off-piste slopes without applying risk reduction measures, nothing happens most of the time. When nothing happens over and over again and the probability of something happening seems remote, we tend to treat the outcome as impossible – according to Daniel Kahneman, expert on the psychology of judgment and decision-making and Nobel Prize Laureate. Our impulses take over even when signs of potential danger are obvious. So rather than asking ourselves “Should we ski this steep slope?” (which faces North, like a number of other slopes that have avalanched following last night’s snowfall… and there’s a big trench at the bottom of the slope), we are easily distracted into thinking, “Let’s get there before the powder’s tracked out!”. Meanwhile, in the back of our minds, we’re reassuring ourselves: “Well, other people are around. There are tracks on the slopes. It looks OK”. I let myself get distracted just like this and I got caught on video setting a big avalanche off. As you can see, it made it to National Geographic, much to the embarrassment of this so-called avalanche expert and educator… who, after this incident, became known simply as ‘The Avalanche Maker’! In brief, I was very lucky not to be killed by this avalanche. I was also very embarrassed – especially that it had been caught on film. However, what this clearly shows is that, no matter who you are, if you don’t apply all the risk reduction measures you learn in avalanche training, things can get dangerous very quickly. Notice there are lots of tracks already on the slope. “Don’t take tracks seriously!” says renowned avalanche expert Bruce Jamieson in his video and paper on the ‘Odds of Triggering a potentially deadly avalanche’ (see below). A FRAMEWORK as a solution. To help you apply basic risk reduction measures, we’ve devised this simple framework solution (pictured below). Here we’ve tried to create a foundation in line with what experts suggest for people engaging in high-consequence, low-feedback environments, such as avalanche terrain. Simple, easily-applied decision tools such as this, can compete with distractions from those ‘human factor traps’ that often lure even experienced people into accidents where there was ‘ample evidence of danger’. Luckily, such tools don’t need to be perfect to save lives… they just need to be simple, easily-applied decision tools that can compete with the mental traps described here. (McCammon 2004). Look for our own HAT risk reduction product – produced in this very spirit, coming soon. Further to how low probability outcomes lead us astray, our solution involves recognising that avalanche terrain is a low-feedback (low probability) and high-consequence environment. In his recent book, Bruce Kay confirms that this as an environment where we have a really hard time keeping risk-vigilant. Our mind starts to wander, leaving us open to human factor ‘traps’, the impulses that lead us to overlook clues pointing to dangers and the simple essential risk reduction measures. A simple illustration from everyday life is that were we to drive on the wrong side of a motorway, we’d receive instant feedback “WRONG PLACE TO BE” (being in a high-validity, high-consequence environment). However, for a similarly high consequence scenario in avalanche terrain, we don’t get that feedback. We let our minds coax us into very dangerous places on the slopes as nothing happens, and we don’t get feedback, most of the time. That’s when ’risky behaviour’ becomes a habit, without us even knowing it! But… since something does happen enough of the time, and since the consequences can be deadly… we need to keep ourselves regularly “in check”, by thinking and looking around us, and by validating our assumptions. Checklists are a good start, but they don’t work on their own. We need to recognise that these Human Factor “traps” are real and that they distract us. So not only do we need to learn the pointers to look out for, but we also need to apply those pointers. We need to think about filtering our impulses by “checking out” what’s going on around us, i.e. validating our quick assumptions. The checklist can help by reminding us on what key points are important, but they have to be applied. This is also where teamwork comes in. We need the people we’re with to remind each other when we’re falling into traps, and to get us all back onto applying the basic risk reduction measures! So finally, we need to work as a team when we’re in the mountains, in order to remind each other to be alert. Indeed, Teamwork is really the fun part. My best off-piste and ski touring memories are of the people I’m with, as much as the snow and environment.